This is the second of a three part series that began last Tuesday on Linux Torvalds’ keynote interview at this year’s LinuxCon. In today’s segment, Torvalds talks about how the GPL has helped prevent fragmentation. He was talking about the Linux kernel community, completing his answer as to the “lowlights” of his years as Linux’s lead developer. “Did you ever really consider walking away from it?” prompted VMware’s Dirk Hohndel, the interviewer and Torvalds’ old friend. The two seemed to be only vaguely aware of the audience as they spoke, although Torvalds occasionally cast a glance in the audience’s direction to keep it engaged. Mostly the interviewer and the interviewee were connected to each other, with the audience watching something of a private conversation being held for their benefit. “I used to be worried about fragmentation and I used to think that it was inevitable at some point,” Torvalds replied. “Part of that was obviously the history of Unix, where everybody who was looking at the history of Unix and comparing Linux through traditional Unix was saying it’s going to fail, because it’s going to fragment, because that’s what happened before and we’ve seen this, so why even bother. There, I think, the license made a huge difference. The “markets” he was talking about include big business, the enterprise and academia, a world populated by supercomputers, big iron and embedded systems, a space with very little consideration for the lowly desktop. “SGI was pushing Linux into thousand core machines and our SMP was kind of wobbly even on eight CPUs,” he remembered. “It was good if you had two, it was okay if you had four, eight was kind of pushing it, and then SGI comes along and says, ‘We have this 256 CPU machine and next year we want to put it on a thousand twenty-four, and long term more.’ They wanted to talk to me about how to manage this and I told them that ‘you should just go off and do your own thing, because we’re not there. You should do your own big iron version of Linux.’ And they did to some degree, but they kept moving things back [upstream] and the standard kernel also kept trying. “You mentioned Android,” Torvalds said. “I don’t think it’s a huge deal. The biggest problem with Android is that in the embedded market on the cell phones you have this odd dichotomy where hardware is the newest of the new. There’s a new chip coming out and three weeks later there’s a prototype phone, and two months later, in some parts of the world, there’s actually a phone on the shelves with this new hardware. The theme that seemed to be developing in the interview was that everything is getting better, which is good to know. 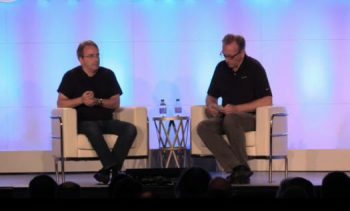 Read Part III of our coverage of Linus Torvalds’ keynote interview at LinuxCon. As indicated by Linus Torvalds in his interview, there has always been some thought, not necessarily concern about “fragmentation” in certain markets for Linux, e.g. in enterprise and government computing. I have also contemplated such scenario, and over past 2 – 3 years have become concerned with the extraordinary influence exerted on GNU/Linux development by large corporations, especially through the Linux Foundation. This organization has systematically removed individual and group Linux/Free Open Source Software (FOSS) Not-for-Profit organization board membership application, even if such person or group were primary Linux kernel or other critical FOSS project representatives. Furthermore, Jim Zemlin, Executive Director of Linux Foundation has steadily and unabashedly advanced the prominence of Microsoft, even over that of any FOSS project, in every Linux Foundation Conference or event associated with FOSS technology with which his organization was involved. My disquiet is the significant proportion of Linux kernel and other FOSS project development that is now almost dependent on “corporate” engagement and backing development that is pushing “all” innovation for “commercial” Linux use, to the detriment of pure technological, scientific/ engineering, education and yes, even Desktop Linux innovation. This trend would be a disaster should Linus Torvalds ever consider relinquishing the leadership and “control” of Linux kernel development, particularly if such control passed to an individual ruled by a proprietary commercial corporation that has no interest or intent on giving back to the community. VMWare is stealing kernel code and Linus never mentions it. The community, as far as Zemlin and the Linux Foundation board, is concerned about is the Corporate interests that make up the Board. I’m guessing they have little to no interest in anything outside how they can leverage Linux to complement their commercial interests. So in respect of Linus stepping down, I just see business as usual.